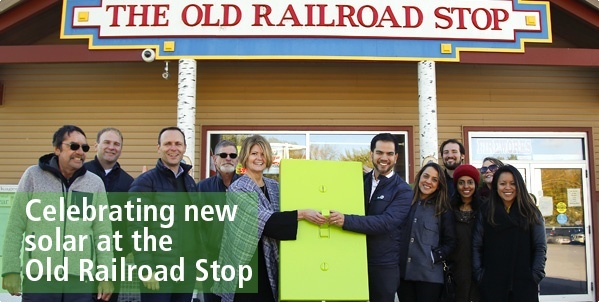 In November, Bullfrog Power and BASF partnered with Hiawatha First Nation in Ontario to unveil a new 22 kW solar installation on the Old Railroad Stop, the community’s flagship business and gathering place. "It is vital to do all that we can to protect Mother Earth and the air that surrounds her, and using solar energy is just one way to shift away from carbon-based fuels that negatively impact our world," says Hiawatha Chief Laurie Carr. Read more about the partnership and the project. Welcome The Printing House, the newest printer to join the bullfrogpowered community! This month, TPH was ranked the #1 most forest-friendly printer in North America in Canopy's 2018 Blueline Ranking, a guide that scores the sustainability performance of North America’s largest printers. In addition to sourcing environmentally certified paper for more than 90% of its paper purchases in 2017, TPH partnered with Toronto Bee Rescue to host eight bee hives on the roof of the TPH office. Proceeds from the hives' harvested honey go toward the TPH Charitable Office to support local charities. Read more in our blog post! Westpoint Naturals is one of the latest businesses to join the bullfrogpowered community. In the spirit of fall, Westpoint Naturals combined two delicious desserts to create a recipe for pumpkin pie brownies! Check it out here. Bullfrogpowered Keep Leaf celebrates beautiful, well-designed products that make the world a better place. Its home and lifestyle items, which include make-up cases, baby blankets and lunch bags, are made ethically and sustainably. If you're a Bullfrog Power customer, did you know you can redeem a Keep Leaf sandwich bag in our Rewards Centre? Click here to log into mybullfrog. Bullfrogpowered non-profit Forests Ontario is returning to the Toronto Christmas Market this year! They'll be next to the ticket tent from November 30 to December 2 and December 7 to 9 to sell locally grown trees and wreaths from Somerville Nurseries. When you visit the Market, be sure to snap a selfie with the big tree for a chance to win two annual passes from Ripley’s Aquarium in Toronto. Real trees bring the aroma of Ontario's trees indoors for the holidays—they are also 100% biodegradable and their sales help support local businesses.